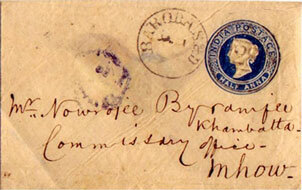 The earliest recorded postmark of Baroda State is "Postage Paid" type date stamp of the Indian PO at Baroda, in manuscript 26th March 1843 on a letter from a British officer to England where it arrived on 13 May. 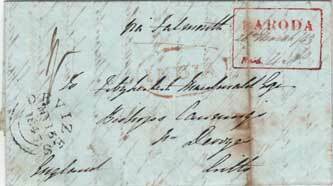 Another example is a cover addressed to Broach with postage "Paid" type date stamp on back with date inserted in the postmark dated 26 October 1855. The cover also bears diamond shaped obliterator with numeral 28. Bombay Numbered obliterator or Barred duplex (Type: A-4) were introduced in 1855 with bars broken in centre to contain a number identifying the office. 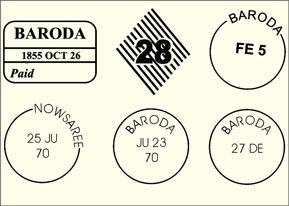 Baroda was assigned number 28 in Bombay circle. These types of obliterators were used till 1873. 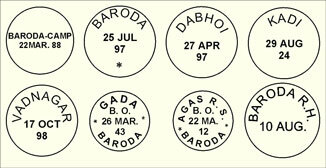 Single-arc date stamps were issued in the Bombay Circle from 1858. Examples are known from Baroda and Navsari (NOWSAREE in Red). 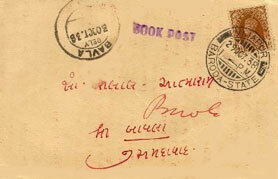 Also examples of single circle postmarks in smaller size used in 1870 (in red) and 1874 (in black) are noted from Baroda and Dabhoi. Below is an example of CDS with W./BARODA/GUJARAT. 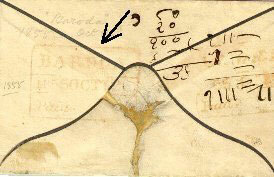 This type of cancellation is not recorded in Early India Cancellation by Mr Jal Cooper in 'Early India Cancellations'. But Brig. Virk has recorded an example of Ahmednagar. 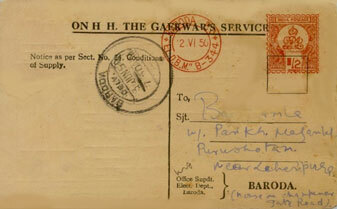 It seems that this postmark was recorded in Bombay Presidency and probably a very scarce one. Though this should be a canceller but in my example it is used as delivery mark. All India Duplex type obliterators were introduced in 1861 and remained in use till 1873. Here the obliterator is enclosed in a circle and date stamp with PO name at top. The example of BARODA S. & D. [Sudder (Head) and Disbursing office] is shown below. The All India Series of obliterators was introduced in 1873 and used till 1884. Each postal circle was allotted a letter that was generally the initial letter of the name of the circle. Each circle was divided into regions under the control of a Disbursing Office. With in the administration of a disbursing office were a number of Head Offices with Branch Offices reporting them. During this period the year was not included on the date stamps. Baroda Disbursing Office was allotted number 17. Below are few examples with B-17 obliterator. Here "B" denotes Bombay circle. The First one is of Baroda City with two parallel bars above the B-17 and three bars below it, dated MAY. 9 (Month first). The second one is of Baroda City R. H. (Receiving House). Here two bars below "B-17" are broken at centre and numeral "1" is placed in the blank space. Numeral "1" denotes Baroda City R.H. Branch office reporting directly to Baroda Disbursing Office. The format of date is different and shown as 7 MAR. (Date first). Baroda Philatelic Society has adopted this postmark as a logo of the society. The third example is an envelope bearing obliterator of Baroda City R. H. Here the date stamp and office name in arc is omitted. 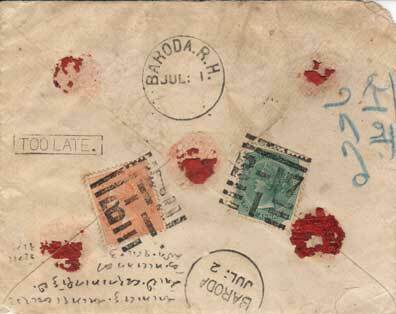 The date stamp of Baroda R. H. dated Jul. 1 appears separately. 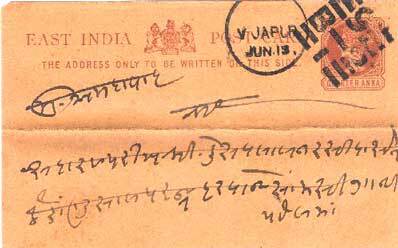 The envelope is registered from Baroda City R. H. on 1.7.1880 to Baroda City (Delivery mark dated July 2) Fourth example is of Baroda Camp. Here "6" denotes Baroda Camp Head Office reporting to Baroda Disbursing Office. Table shown hereunder shows the numbering system for other towns of Baroda State placed under other disbursing offices. In 1880 duplex round obliterators (Type 19-A) were introduced with circle letter. 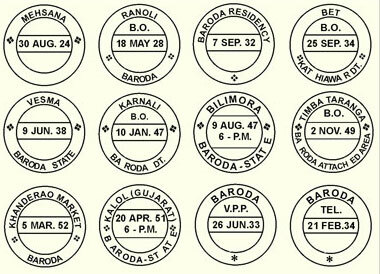 Examples are known with words 'BARODA' and 'BARODA CITY' with letter "B" of Bombay circle. The year type is omitted in the postmark. These obliterators were used till 1885. In 1883 Squared Circle obliterator were introduced with the combination of date stamp and obliterator formed by adding, outside a single circle, several bars at a tangent tapering to squared corners. Like round obliterator, example with 'BARODA', 'BARODA CITY' and 'VISNAGAR' are noted. In case of the Baroda, the date setting varies. One example shows the date as SE 16 89 (month first) and another shows 13 JU 93 (date first). Also the size varies. The first measures 18 x 18mm with four bars and the second measures 21 x 21mm with three bars. 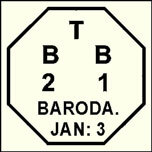 BARODA CITY examples measure 21 x 21mm with three bars and observe the first date pattern. These types of obliterators were used till 1910. Single circle date stamps were introduced in late 1880s. Examples are noted from Baroda, Baroda-Camp, Dabhoi, Chandod, Wadnagar (Vadnagar), Beejapore (Vijapur) and Patan with post office name and date in straight line. Other examples noted are from Baroda-Camp, Baroda Ry. Stn. (BO), Baroda R.H., Baroda, Agas R.S./B.O., Kosindra B.O., Dabhow, Gada B.O., Dabhoi, Unjha B.O., Gozaria B.O., Patan, Kadi, Mehsana R.M.S., Vijapur B.O. and Vadnagar with post office name in arc. Use of single circle date stamps were also noted in late 1940s. Double Circle Combined Date Stamp (Type A-23) were introduced by 1894 and used till 1926. These types of date stamps are without hour and with segments of inner circle filled with vertical obliterating lines. Below is an example of Baroda with BARODA/Z 14 AU 94, measuring 25 mm. 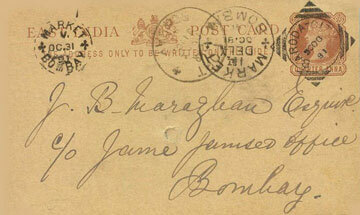 Similar postmark with time slug (Type A-24) were also used between 1896-1926, an example here is from Baroda City. Similar type is also noted for Sidhpur, Patan, Kalol and Vijapur of Kadi Division. Postmarks in size of 30 mm are also noted. Double Circle Combined Date Stamps with obliterating Arc with hour slug below the date were used between 1910 and 1936 or even later. Examples are noted from Baroda, Baroda Residency (two different with variation in sizes of arcs), Lehripura, Fatepura, Baroda RMS, Vaso and Padra of Baroda Division, Harij, Sidhpur, Vijapur, Visnagar, Kadi, Mehsana of Kadi Division, Dhari of Amreli Division and Navsari. A variety with two small pieces of arc in the circle is also noted from Nar (without hour type), Baroda R.M.S./Set-3, Savli and Freelandganj of Baroda Division, Vijapur, Dhinoj, Patan, Kalol and Sidhpur of Kadi Division and Bilimora of Navsari Division, suffixed 'Baroda State'. Example of Amreli is noted with suffix Bhavnagar. 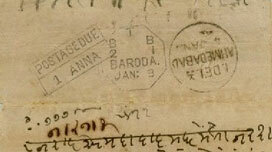 Double circle postmarks with only date (without hour) are noted from Baroda, Khanderao Market, Baroda Residency, Dabhow BO, Karnali BO, Piploi BO, Sadhi BO, Ranoli BO, Waghodia B.O., Dabhoi, Lehripura, Vadu, Padra and Savli of Baroda Division. Examples of Vesma, Vyara, Pacchiapura are noted from Navsari Division. Okha Port, Chhala BO of Amreli Division, Randheja BO, Patan, Harij, Gothwa BO, Gozaria BO, Lodra BO, Ranuj, Balva BO, Vasai Dabhla, Adraj Merda BO, Ambliyasan, Atarsumba, Bechraji, Chanasma, Kheralu and Visnagar of Kadi Division are noted in same style with or without suffix Baroda State. Example of Unava Balva is noted with suffix N. GUJARAT while Bet BO (Okhamandal) with suffix KATHIAWAR DT. 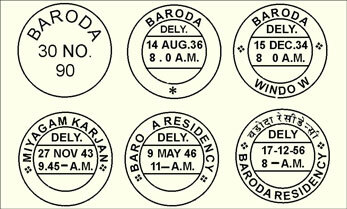 Similarly double Circle Postmarks with date and time are noted from Ambaliasan and Kalol of Kadi Division and Bilimora of Navsari Division, with suffix Baroda State. Under the Attachment Scheme of 1944, Bilkha, Vadia, Bahana, Manda and Malpur states were attached to Baroda State. An example of TIMBA TARANGA/B.O./2 NOV. 49/BARODA ATTACHED AREA is shown below. Another example is SUIGAM/B.O./13 OCT 47/BARODA ATTACHED AREA. Double Circle Postmarks for other systems of postal services are also noted. 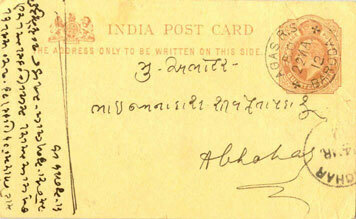 A double circle postmark with "BARODA/VPR/31 MAY. 44 was noted in India Post #115 by Mr. Ashok Bayanwala. Other such postmarks are known for Registration (REG. ), Telegram (TEL. ), Parcel (Par.) and V.P.P. Below are examples of Rectangular Combined Date Stamp with slogan. Examples are noted with slogans "Support the Jubilee Fund", "Increase your business by using Trunk Telephone" and "Buy Post Office Cash Certificates" (Used from Baroda and Navsari). 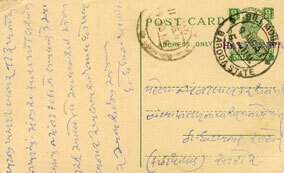 Usage of such postmarks is noted between 1933-47. 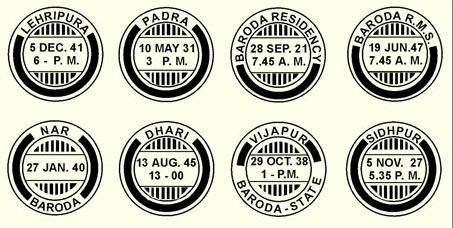 Examples of comet type combined date stamp are noted from Kalol (Gujarat), Sidhpur (with suffix Baroda State), Sojitra and Baroda Residency. Below are two examples. Comet type cancellations were used between 1940-47. A "Pre Paid Postage" system was introduced in the year 1889 for bulk mailing. By 1900, a special oval shaped postmark showing words "POSTAGE PAID IN CASH" was introduced. Later on it was changed to "POSTAGE PRE PAID IN CASH". See below. A Recorded postmark of Railway Post Office is type 22 in octagonal frame with inscription of Railway line and town from which the letter has travelled to its destination. Here is an example dated Jan: 3 (Year type is omitted) with T/B/2/B/1 (probably used in 1888). Unpaid entire with Postage Due mark has travelled from Baroda to Ahmedabad. Recorded example of meter franking is from the Department of Electricity, Baroda State, shows "BARODA P.O. "EL.D.B.M." B-344" [Half Anna.] dated 2.6.1950 (a very late usage !!). Shown here are examples of various delivery marks used in Baroda, Kadi and Miyagam Karjan. 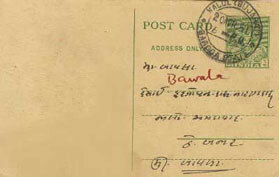 Even after Independence postmarks with suffix "BARODA STATE" were in use for some years.